You'll be £30.00 closer to your next £10.00 credit when you purchase Back Bearings. What's this? Eric Cropper's RAF career started in 1943 and ended in 1968. It covered a period when the navigation of aircraft changed from astro, dead reckoning and drift bearings all plotted by pencil on charts, to press-button radio and satellite information that can instantly pinpoint a position anywhere on the planet to within 5 metres. The then vital skills of a good navigator are now mostly redundant. Ships, aircraft, trucks and cars seldom use maps let alone carry a navigator. This autobiography by one of the RAF's top exponents of both the ancient and modern forms of the art explains in considerable detail how this rapid and revolutionary improvement occurred in the air. This is a fascinating memoir of one of the RAF's senior navigational experts that explains both service life and the revolution in navigational techniques that took place during his service career. When this book was offered for review, I looked forward to reading it as, during my time with 202 Squadron, I had regarded the navigator as the brains and hardest working member of the crew and was very interested in the combination of science and black art that they practised. The book works best as a narrative of the life and times of a career senior officer, who has a great interest in his specialism, but does the full gamut of General Duties. The details of Eric's service life and career together with the variety of tasks in each of his non-flying posts make interesting, if not riveting, reading and the effort that went into organizing and implementing navigation training is an eye-opener. I found the account of his tour as Station Commander Gan particularly interesting. I found the book readable, because of a prior interest in air navigation, others may find the career and personal life parts more interesting. The RAF career of Eric Cropper was unusual in that he was a navigator while most accounts are by pilots. As such, it covers a forty-year career from a very different angle. Basic navigation training was at 5 AOS, Jurby, on the Isle of Man. Unusually, he never went through an Operational Training Unit but was posted directly to 1651 Heavy Conversion Unit to fly in Stirlings before moving on to No.103 Squadron, with which he did a full operational tour. He survived despite being hit from behind by another Lancaster and losing a large part of the tail, including the rear turret and gunner. He then moved to Shawbury as an instructor. Deciding to stay on in the RAF, he held various posts in Bomber Command, culminating in a two-year exchange posting to he USAF. This unexpectedly was to Alaska where he found a different world but blended into the USAF command quite rapidly. He and his family found a warm welcome - apart from one armed guard who intercepted Eric and his fellow RAF exchange pilot as they walked back from their F-89 with helmets and parachutes. Their identity was demanded as their uniforms were not standard USAF garb. Being told they were RAF, the guard lined them up against a wall while he called for help. Rescued by USAF officers, the guard was questioned by his CO. In mitigation he said he thought they were infiltrators and the RAF stood for Red Air Force. After a period at the Air Ministry, he was posted at short notice to become Station Commander at Gan. Returning, he became CO of No.53 Squadron with Beverleys, and ended his flying career at Manby, followed by staff duties in Maintenance Command. This is a very readable look at the 1940-60 period in the RAF's ever-changing evolution. From the Dalton Computer to satellites, it brings back memories of rather hit-or-miss procedures, full of triangular velocities and mumbles of 'Cadbury's Dairy Milk Very Tasty' as information was fed in. Told with feeling and a touch of humour, it gives a good 'feel' of life as a post-war RAF officer. 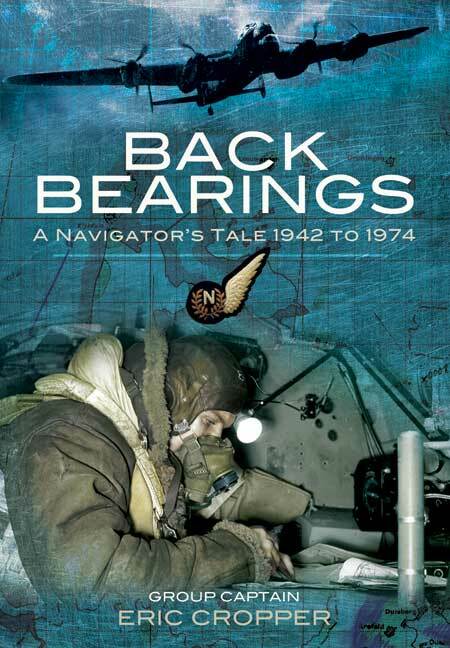 An excellent and well written book on the life and times of an RAF Navigator. This is a fascinating memoir.